Runners Inspiring Runners – Gelcys aka Cheetah | So What? I run. Did I tell you how much I love doing my Runners Inspiring Runners series?! While reading other running blogs, I came across Runner Unleashed. Immediately I was drawn into her story. I had planned on sending my typical amateurish interview questions, but that wouldn’t do her justice. Her story must be told in her own words, in her own way. When I messaged her to see if I could share her story, she said, “Absolutely! Share away!!! I mainly created this to help others see that there is a way to reach your dreams. You just have to believe in yourself and never give up.” Ahh…yes, a runner after my own heart. 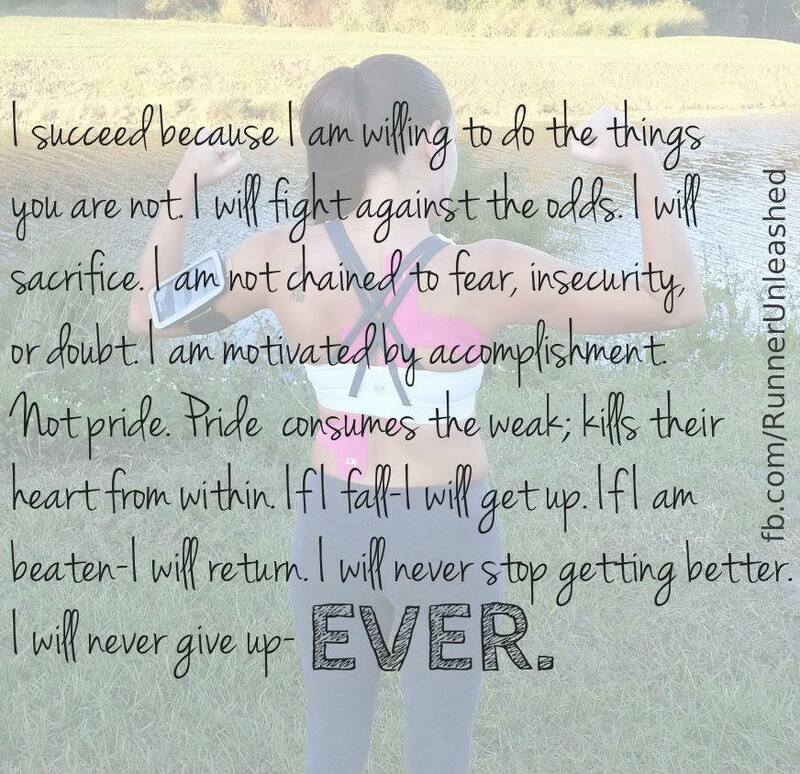 Below are excerpts from her blog, but I encourage you to follow her story on http://runnerunleashed.com/. I have been a runner for several years now. A little history on how I got where I am… I’ve been a runner my whole life, but unfortunately I was diagnosed with Scoliosis, which to those who don’t know its a curvature of the spine. I was 14 years old when Doctors found it and I was told I need corrective surgery immediately. I must say for a 14-year-old who has never gotten a scratch this was very intimidating. Worst part was, I was told I could never run again. After spending 14 hours in the operation room it was all over, SUCCESS! My back was corrected now on my way to a long recovery. Six months in, getting picked up from school, we got rear ended in a car accident, and requiring emergency surgery due to one of the metal rods put in my spine had came out! Eww yes it hurt…and BAD. Physical therapy for months, another 2 more surgeries and years later I was doing better. Final outcome, I still have severe Scoliosis, had the rods taken out of my back, and have a higher hip on my left and my leg is shorter by 1 inch. Now out of college working hard, I meet my husband, RC. Who crazy enough I knew from high school. We didn’t get along, as he sat behind me in class and always picked on me. We graduated and went our separate ways, he went to the Army and I went to College. We ran into each other by chance, and here we are, 7 years later with a 4-year-old terror. We decided to move to Central Florida for a change from the south Florida lifestyle, we couldn’t be happier. They are my world and would be lost without them. RC and I have always been active, but I always had a problem running after all my surgeries. We then started running, but 200 meters in, I would end up walking and was miles behind him. After several attempts and Doctors appointments they told me I can’t run because my left lung doesn’t have a lot of room due to my spine curving into it, among other physical issues. It broke my heart. After moving to Orlando, I was able to do more outdoor activities. I would walk with my son to the park so he can play. I always saw several people running, training, staying fit. It motivated me to go after what I really wanted to do in life. I told my husband. ”I wanted to run! !” so he said “I’ll train you.” I got a little nervous since he was the fastest and the squad leader in his running team in the Army. Little did I know that was going to help me in the end. I started running, from meters to miles, slow and steady. I ended up with some chronic pain that I can’t do anything about because it stems from my Scoliosis. When I see a doctor they tell me I can’t handle running so I shouldn’t try. I suffer daily from back pain, worse on some days than others, shin splints are common due to my shorter leg, and the hip flexor, I must say gets very irritated. Aside from all the issues I have from running. I learned to never give up and go after my goals. I sometimes have to push myself through the pain, let’s not forget the common runner injuries, because yes, I also have been blessed with those too. But you know what?? I’m a fighter, I learned to push through barriers and walls to make my dreams a reality!!! And now…here I am today…A MARATHONER!!!! I am doing what I never thought I could, so never give up on something you believe in, because if I can do it, ANYONE can! This entry was posted in Runners Inspiring Runners and tagged Inspirational stories, inspiring runners, Marathon Running, Physical therapy, Running, Scoliosis, Sports, Surgery, Training by SoWhatIRun. Bookmark the permalink.